The new investor is also looking for their first employees. CBRE, the world leader in real estate services, brokered the negotiations for Simoldes Plasticos, which invested in the new production hall in the urban part of Lipovka, in the immediate vicinity of Kvasiny. They are also seeking their first employees. The completed hall, which is already roofed, is expected to open at the last quarter of 2015. „For Simoldes this is a strategic location because it supports our customers strategy and growth. We believe it is the right location not only to supply Skoda Auto plants but also to supply other OEM plants within Central and Eastern Europe. The adequate infrastructure and the availability of technical knowhow combined with Simoldes experience and expertise make us believe that this new facility will be capable to deliver quality and competitive products and services, recognised by our Customers,“ said Jaime Sa, CEO Simoldes Plasticos. Simoldes new production hall will open in the first quarter of next year, and will supply automotive components to Volkswagen group, including Škoda and other OEM’s. The construction is now roofed with the last part that needs to be covered and then interior work in the building will commence. 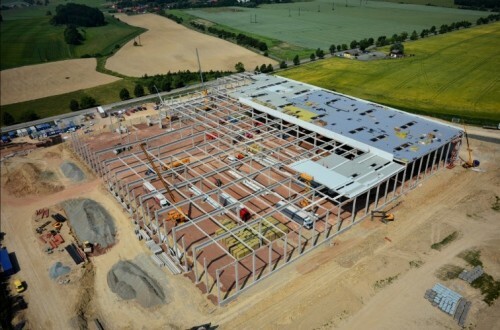 The total area of the hall will be 22,000 sq m. To get an idea of its size, 176 pillars will support the 1,000 t roof. 25 companies have worked on the hall with a total of 200 workers. The hall will be outfitted with 20 km of cables and 1 km of piping.